- After having obtained a beautiful green color (by mixing for at least a minute), remove any "yellow grains" or parts that have not been mixed, or are already slightly cured. - Always lubricate your tools (with water, oil or petroleum jelly…) and have a clean work area. 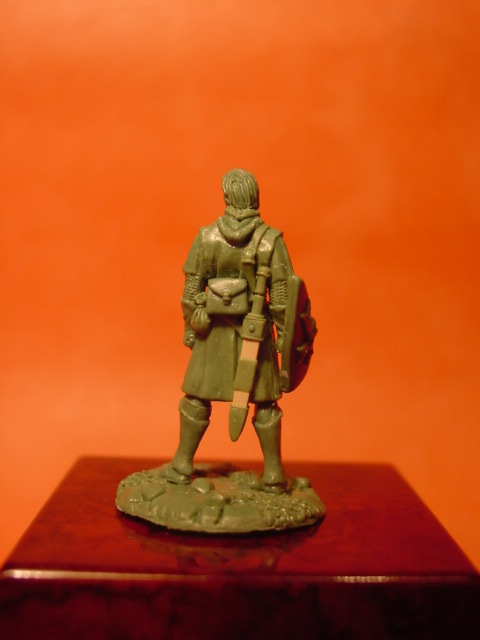 - Always build up a figure with several layers rather than trying to sculpt all at once. - Test various mixtures of GS by adding different ratios, ie: more blue than yellow or the reverse. You will see that the different ratios can have very different properties. - The GS has properties which change when it starts to cure. This means you should do some parts of a sculpture with fresh GS, and others with it slightly cured. 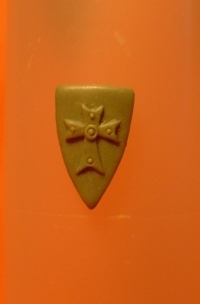 - Do not prepare too much GS (You will normally only need a little when making miniatures, and you can always mix more). - One can accelerate the drying time of the duro by placing it under a lamp (warning! If the heat is too high, the surface of your mini can burn). 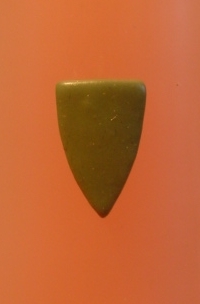 - Once cured, the duro is like soft plastic and it is very difficult to sand/file down. 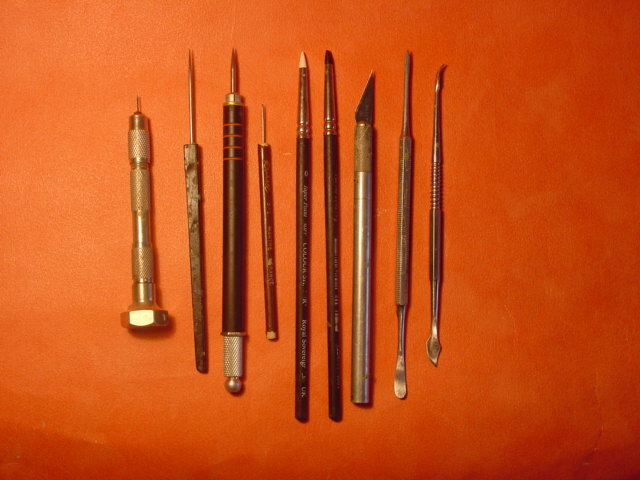 Needles assembled on the handle of old brushes, 2 or 3 tools that my dentist gave me, 1 or 2 clay shapers (these help with the smoothing of the GS) and a hobby knife, or blade (like X-Acto or another). A glass of water, oil (petroleum jelly or others) to wet the instruments, different grades of iron wire, toothpicks and a hand drill. 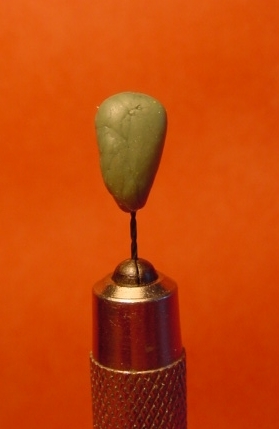 A grip to hold the figurine (a wine bottle cork works well and is used by many sculptors). To avoid accidents, make sure your work area is clean and has a cover to protect it from spillages etc. 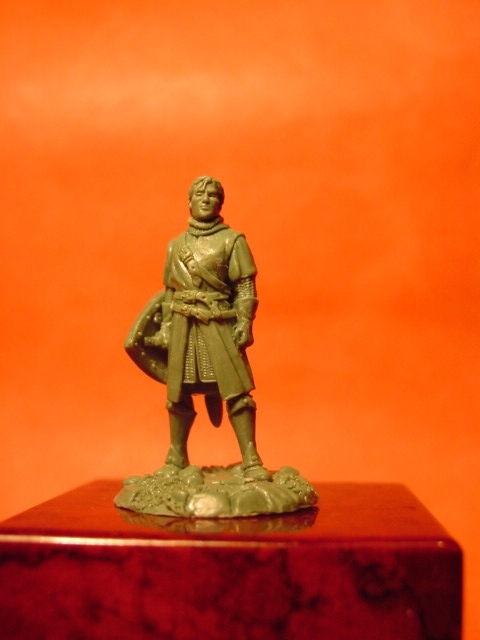 The face is the most significant part of the figurine, because it is seen first by most viewers. Therefore, you must take time and care to sculpt it. 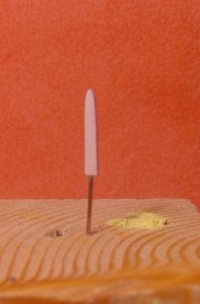 On a toothpick, I coarsely model the shape of the face with a needle. This stage is significant, because if this basic shape has anatomical errors, they will be seen on the finished face. (Before you start on faces, it is a good idea to look at books on "how to draw". These will give useful tips on common proportions and characteristics, to help produce a convincing and attractive finished product). I let the face dry. 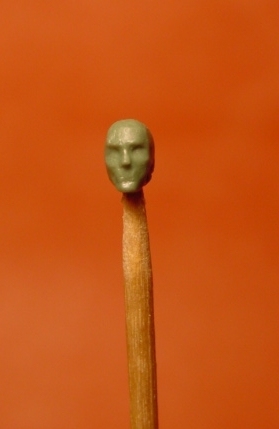 Note: I always sculpt the faces on a toothpick, because this method makes it possible to reach all areas of the face. 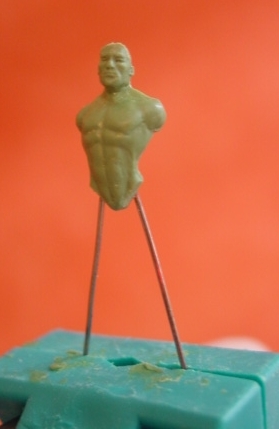 In general, when I have a little left over duro, I make small balls that I put on toothpicks. This provides a more solid base to work on. I sculpt the face by adding small pieces of duro to strategic places, like the cheeks, the eyebrows, the jaw, the eyes and below the nose. I also apply the ears and the hair (I generally let the head dry before adding the hair, but as it is a short cropped style in this case, I made an exception). The creation of the chest begins with a GS ball. I do this part separately so the skeleton does not obstruct me during my work. I leave it to cure. 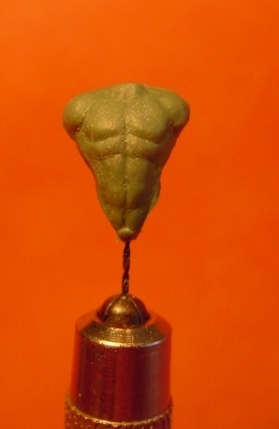 I set up the muscles with small balls of greenstuff that I smooth to bind the different parts. 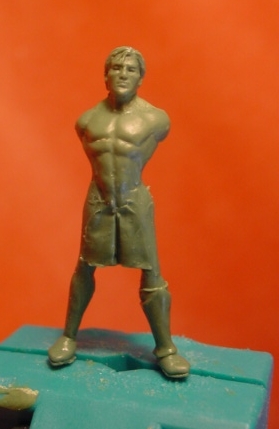 I always sculpt the musculature even if I know that it will be hidden in the end, because I find that it helps me make figurines that are more realistic. I leave this to cure. I drill the hips and insert iron wire to make the legs. I also drill the neck and I fix the head with a flexible iron wire to be able to test various head positions. When I find a position I like, I make the connection with the chest by sculpting the neck. Note: I have removed the hair, because I am not happy with the first attempt. 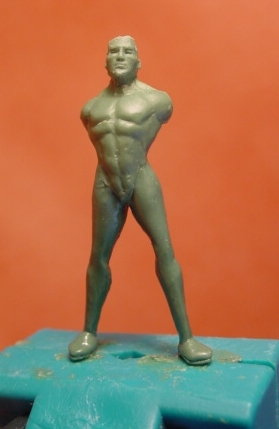 I sculpt the legs next. 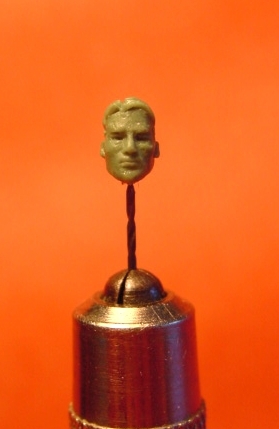 Note 1: Having attatched the head, it is now easier to judge if the miniature has pleasing and believable proportions overall. Note 2: You can also see that I do not use a cork stopper to hold the figurine, but a grip which I find more practical. This is because I can easily remove it to reach difficult places on the sculpt. Note 3: Don't cut the wires for the legs too short (I always leave 10-12cm) because it is sometimes very useful to be able to hold your figurine with these wires. I leave these parts to cure. I add the hair by applying a ball of duro in which I «engrave» the strands with an X-Acto knife. I fill the space between the legs to have a solid base to sculpt the chain mail upon. I also add the right legging/boot to see more accurately where the hem of the tunic should fall. I leave this to cure. I add a very simple decoration on the legging. I sculpt the draped skirts, by adding small rolls of GS to make the folds. For the arms I drill the shoulders, and insert iron wires in the holes (as was previously done for the legs). 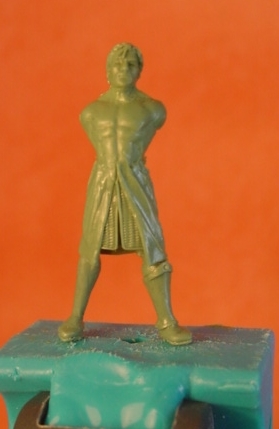 I then sculpt the arms by loosely adding the basic musculature. 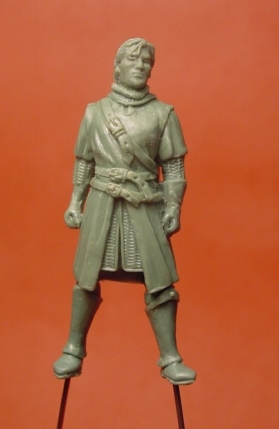 I sculpt the tunic by using small rolls to make the folds. I finish the chain mail of the arms and around the neck with a pin. I add the sleeves of the tunic. Then I sculpt the left glove and the right hand (though I don't sculpt the right hand glove for the moment, because this arm will carry a shield). 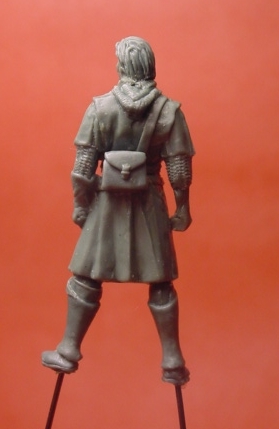 I sculpt the pack on his back.. When the surplus GS I mixed previously starts to cure and be more "plastic" (after about 1 ¼ to 1 ½ hours) I make a sheet of it by spreading it out thinly. I cut some bands to make the belts, and apply those to the figurine, making sure not to damage the parts I have just finished. Lastly, I add the loops of the belts. I let these cure. I sculpt the right glove, and I check to make sure there will be no problems when I add the shield on the arm. I finish the right legging. To do the shield I spread out a rather thick sheet of duro. As when doing the belts, if you work when the duro has started to dry, it is easier. 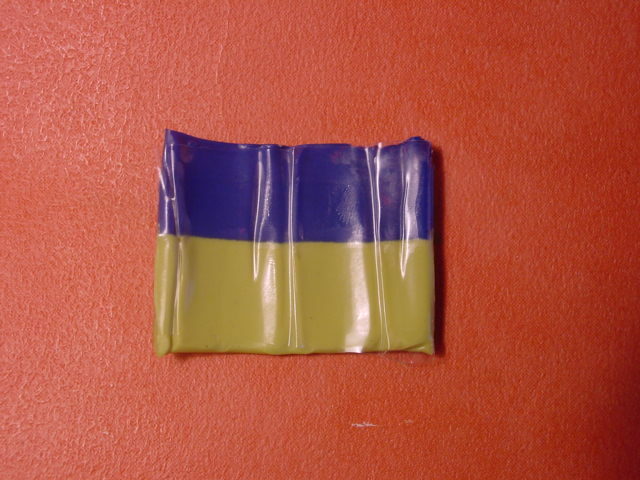 I cut the shield shape out, and then lay it on a plastic tube to give it a slightly convex form. This is then allowed to dry. I add the cross, and some small rivets done with tiny balls of greenstuff. I let this cure. 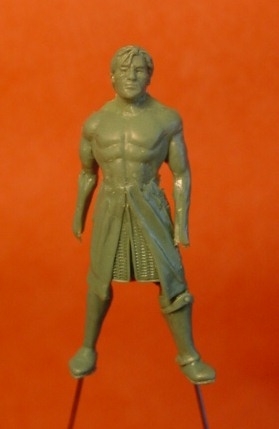 I take off the shield and I sculpt the other side. For the sword, I coat a metal wire with Andrea Sculpt (it is like Milliput) and I crush it between two chalked plates. Once dry, I sand this down to give it the correct final shape (this can be done with a Dremel for convenience, though be careful!). Then I make the handle with greenstuff. 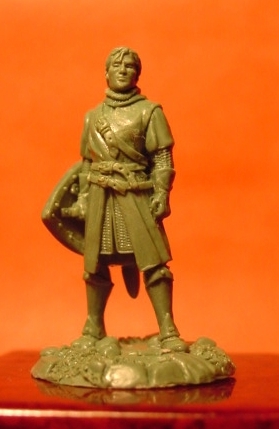 Note: If the figurine is intended for casting by vulcanization, it is preferable to reinforce the swords and others weapons with a metal wire. 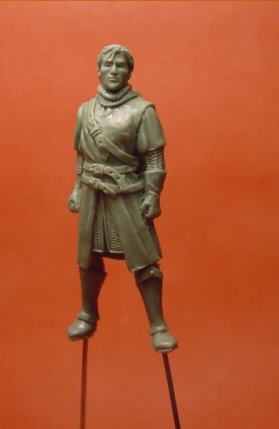 I add the sword by sticking it on the figurine and I sculpt some decorations. I finish by sculpting the straps on the shield. 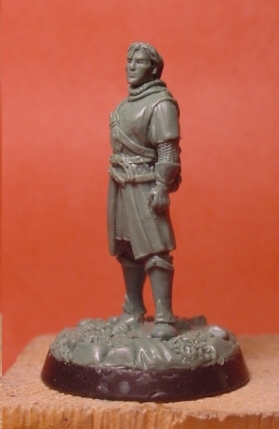 Here it is... the finished figure. 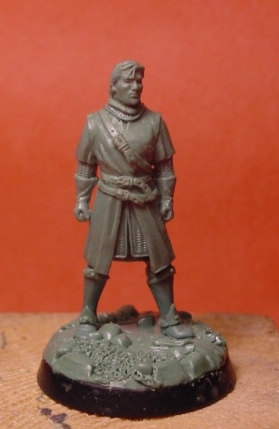 Thanks a lot to Peter Shepheard from Sacred Blade Miniatures for is big help during the translation. Wow..... Now I'm sad about my "skills"
Awesome my friend!!! Thanks for sharing! Thank you for sharing this, it's very inspirational.